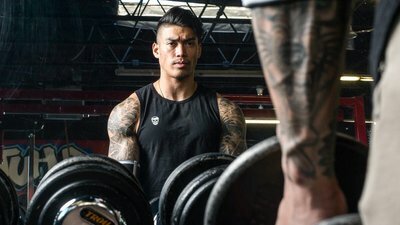 Working as a Bodybuilding.com customer service representative helps Saniranh keep his spirit and fitness on speed dial. Here's how this diehard lifter brings the spirit of Golden Age greats like Serge Nubret back to life in his training! Niranh Saniranh was a skinny, acne-prone kid who felt alone in the world and awkward at school. Then, at age 17, he started lifting weights. The change was immediate and positive. With each bit of muscle and strength gains came matching gains in confidence, but also in spirit. Whereas he'd once lived in a dark, isolated mental spot and was an easy target for other kids, Saniranh quickly came into his own. By 18, he had transformed his body and was already prepping for his first competition, and he hasn't stopped since. A classicist at heart, he follows the exact programs of iconic, 1970s-era bodybuilders. He likes their simplicity, technique, and of course, their results. But it's more than just technique and momentum driving him forward. Saniranh and the weights have "become one," he says. Today, Saniranh is one of our brilliant customer service representatives, a first responder to the calls for supplement guidance and training and nutritional help. Here's what he had to say about working with his Bodybuilding.com team, working out by himself, and learning alongside our customer base. When did you get into fitness? I was athletic when I was a young kid, playing basketball all the time, but when I got to high school I had a hard time with my physicality for a while. I was really skinny, I had bad acne, and people made fun of me, so of course I became introverted and shy, which made everything worse. I had a really hard time socially. I didn't fit in, and I didn't like what I saw in the mirror every morning. Things were rough. But when I was 17, a junior in high school, I had a friend encourage me to work out. He told me that gaining muscle would change a lot of what I was dealing with, that it would make me feel better about myself and would also put my mind in a better place, and he was right. I started going to the YMCA with him, using his guest passes and then buying day passes, and I got bigger really quickly. After a few months, I joined a Gold's Gym and I haven't stopped working out since. Has your fitness regimen changed over the years? It hasn't much! In the first few months of working out, my arms got really big and people at school were like, "Dude, your arms are huge, like a bodybuilder." Because people were saying that, I would go home and look up bodybuilders on the Internet. I found Ronnie Coleman, and I was just fascinated by the lifestyle. I started watching videos nonstop. I fell in love with the sport, and was kind of addicted. I've been doing what bodybuilders do ever since. Maybe one thing that's different today is that I really like to work out by myself. I put in my headphones, clear my thoughts, and it's just me. It releases all the stress. And there's a sort of next-level connection I have with the actual weights themselves. Something happens when I pick them up. It's hard to explain, but me and the weights have a connection. I owe thanks to them because they saved my life, and I'm in touch with that when I lift them. I don't know if anyone ever says that, but it's a spiritual experience, you know? It's like Bruce Lee says, something like, "Empty your mind, be formless. If you put water in the cup, it becomes the cup." That's kind of how I feel when I pick up the weights, that the weights and I are one. I signed up to do my first show at age 18, actually. I'd gotten really big in the past year. I weighed 185 pounds, so I had to diet down. I actually got under 150 and was pretty shredded, but I got scared. I was worried that I wouldn't be able to win, and if I couldn't win then I didn't want to do it. I don't know what that was about. Just fear and nerves, I guess, so I backed out. Then, when I was 23, in 2015, I finally did my first show, the NPC Idaho Cup, and I placed 4th in the Men's Physique class. This year, I did my second show, the NPC Idaho Muscle Classic, and placed 3rd in Men's Physique and 4th in Classic Physique. What's it like working for Bodybuilding.com? It's awesome man, because you see pretty ripped and jacked people walking around, and it motivates you. Since I'm on the phones, I'm talking about fitness, nutrition, and supplements constantly, so it helps me stay on the right path, and to stay with my regimen. It's a really good environment. My co-workers are like friends and family, to be honest. It's one of the few places I've worked where everyone has a really good vibe and aura, and we all just mesh really well. Nobody freaks out when you're eating tilapia every day, stinking up the kitchen, because everybody just gets it, and it's nice to be somewhere people really get you. What's your favorite feature on the Bodybuilding.com site? I like the articles. When I'm working with a customer and they ask me something I don't know off the top of my head, like maybe they want a product to help with shuttling or nutrition partitioning, I'll look it up on our site and find an article and learn about it with the customer. I actually learn a lot that way, from customers needing to know something I might not know, and we have all the articles that help with that. What's in the big picture for you? When I was younger, like I said, I wasn't happy with my image, and I got made fun of. When you're that young and you don't feel like you fit in, you go to a really dark place. But bodybuilding improved my confidence and improved my personality, and I just want to support that message and use my influence to tell people that living a healthier lifestyle really does help your overall life. It really does improve a lot of things. I want to spread that message. Also, I want to compete as a professional men's physique and classic physique bodybuilder. I've got a long way to go, but I think there's only one road for me right now. I think that I just want "Plan A," you know? So, all the way to the end on that one, for me. What's your diet and supplement regimen? I've been doing intermittent fasting for about three years now and it has been effective for helping me build muscle and maintain low body fat. Alongside this, my body reacts really well to carb cycling. So, I will normally fast 4-5 days out of the week with carb cycling. I fast for about 16 hours and have an 8-hour feeding window. If I have more fat to lose, I like to up my fasting time to around 18-20 hours with an eating period of 4-6 hours. I keep protein intake to around 200-250 grams, carb intake to 50-100 grams on low carb days, 150-200 on moderate days, and up to 400 on high carb days. I tend to keep fats at under 100 grams. My main sources of protein are chicken, tilapia, salmon, lean ground turkey, and eggs. My main sources of carbs are white rice and brown rice. I like to get my fats from places like peanut butter, almonds, avocado, and coconut oil. I don't take too many supplements, as I believe more in perfecting my diet. However, I do like to take creatine and a whey protein, and I like the Bodybuilding.com Signature supplements for those. What's your training split like? I'm really into following the old-school bodybuilders. Right now, I'm big into Serge Nubret, a French bodybuilder who was in his prime back in the 1970s. His training split is a little different than what's considered normal today. Basically, I work out six days a week. The first day is mainly chest and quads, the next day is back and hamstrings, then shoulders and arms the next day. And then it's a repeat, with a rest day breaking it up on the seventh day. I've been doing it like this for the past five or six months, but even before Serge Nubret's training, I have always liked to do opposing sides of the body in one workout, like chest and back on the same day or quads and arms. Nubret's main goal was to force as much blood into the muscle as possible for as long as possible. I try to do moderate weights, and, with every workout, I'll do 3-4 exercises for each muscle group, 6-8 sets, and 10-12 reps. Since I'm working with moderate weight, my rest time is cut down to 30-45 seconds.